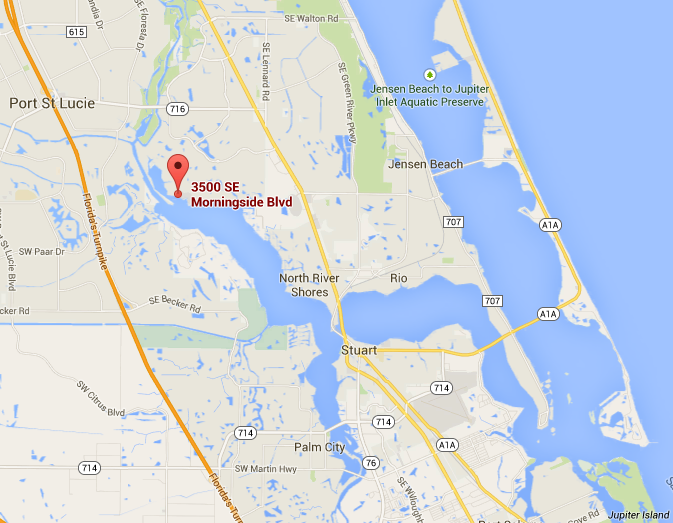 Sandpiper Bay Marina is located at 3500 SE Morningside Blvd, Port St Lucie, FL 34952-6116. Port St. Lucie is a city in St. Lucie County, Florida, United States. Located north of the St. Lucie Fork River, and south of Fort Pierce, FL. To its east is the Atlantic Ocean. ​According to the United States Census Bureau, the city has a total area of 76.7 sq mi (198.6 km2), of which, 75.5 sq mi (195.6 km2) is land and 1.2 sq mi (3.0 km2) (1.50%) is water.Port St. Lucie features a warm humid subtropical climate, falling just short of having a true tropical climate. Summers are usually hot, with temperatures averaging low 90s. Winters are usually mild to warm, with average temperatures around 70s°F. The average yearly precipitation is around 53.5 in. Port St. Lucie is served by St. Lucie County Public Schools, which is a school district which serves the rest of St. Lucie County, FL. In Port St. Lucie, there are six elementary schools, seven K–8 schools, four high schools, and three post-secondary institutions.The city is home to New York Mets spring training, the St. Lucie Mets Florida State League team and the Mets rookie level team in the Gulf Coast League.